BATTERIES / CHARGERS / POWER SUPPLY. ELECTRIC MOTORS / SPEED CONTROLS. GLOW PLUGS / STARTERS / CONNECTORS. Electric Starts / Start Box. Motor Bikes / Dirt Bikes. OIL / GLUE / GREASE. RADIO / RECEIVER / SERVOS. WHEEL / TIRES / RIMS. Wheel / Tires / Rims Sets. Bodies / Lights / Accessories. Accessories Glow Plugs, Temp Guns, etc. Parts Tune Pipes, Gas Kits, etc. Venom / Atmoik Vehicle Parts. Nine Eagle Solo Pro Parts. Slot Cars Tracks / Sets. Adhesives / Fields / Tools. Building / Bridges / Tunnels. Figure / Track Side Accessories. Grasses / Trees / Scenery. Trains / Tracks / Sets. 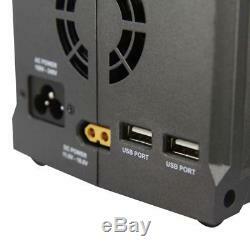 Airsoft Chargers / Power Supplies. Air Brush Sets / Compressors. Paint - Aerosol / Spray Cans. Paint - Air Brush / Bottles. Aircrafts / Boat Kits & Parts. Airplane / Helicopters / Quads. Electric Motor / Speed Control. Oil / Glue / Greeas. Radio / Receiver / Servos. Wheels / Tires / Rims. 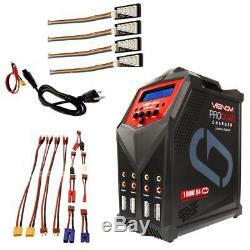 Venom 0686 Pro Quad 100W X4 AC/DC LiPo/LiHV/NiMH Battery Charger. 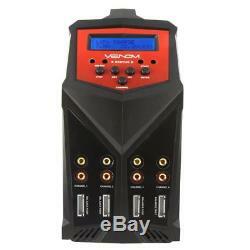 Venom Pro Quad 100W 7A 4-Port AC/DC LiPo, LiHV & NiMH Battery Balance Charger. 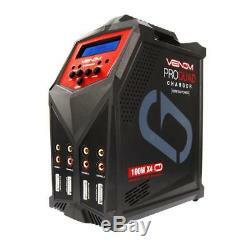 Building on the success of our Pro Duo charger, the Venom Pro Quad 4-port, 7.0A Multi-Chemistry balance charger is the ultimate solution for hobbyists looking to charge multiple packs quickly and conveniently. Featuring a monolithic vertical stance, this charger saves valuable bench space by providing four complete charging circuits, each with its own dedicated 100W integrated power supply in a footprint similar to most single output chargers. Having four dedicated power supplies in one compact package means all four channels are able to receive 100W of power, ensuring you are not diluting your amp rate when charging two, three, or four packs simultaneously. Discreetly located on the back of the charger are two powerful USB 2.3 Amp charging ports to conveniently power your USB devices. Menu navigation is made easy with a five-button control interface and brightly backlit LCD screen. All the most common battery chemistries are supported including: LiPo, LiHV, LiFe, Li-Ion, NiMH, NiCD, and Pb (lead acid) with a complete assortment of charge leads included in the box along with extra long balance leads to make safe charging in a LiPo sack effortless. Height: 9.25 in (235mm). Width / Diameter: 4.25 in (108 mm). Input: DC 11.0V-18.0V - AC 100V-240V. Circuit Power: 4 x 100W. Charge Current: 4 x 0.1 - 7.0A. Current Drain of Balancing Lipo: 300mAh per Cell. NiCD/NiMH Cell Count: 1-15 Cell. Discharge Rate: 0.1 - 1.0A. 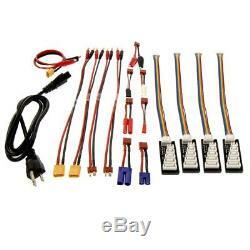 Included Charge Leads: Alligator, Deans, EC3, EC5, HXT 4, JST, Receiver (RX), Tamiya, XT60. Fits the Following Model(s). Make sure you select the correct Postal address when paying for this item. Majority of packages arrive between 2-5 days. Please work with us to resolve any issues. There are always ways to work things out to meet your satisfaction. Every customer is important to us. 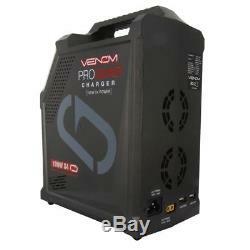 The item "Venom 0686 Pro Quad 100W X4 AC/DC LiPo/LiHV/NiMH Battery Charger" is in sale since Tuesday, August 8, 2017. This item is in the category "Toys & Hobbies\Radio Control & Control Line\RC Model Vehicle Parts & Accs\Control, Radio & Electronics\Chargers". The seller is "nzhobbies" and is located in Alpharetta, Georgia. This item can be shipped to United States, Canada, United Kingdom, Denmark, Romania, Slovakia, Bulgaria, Czech republic, Finland, Hungary, Latvia, Lithuania, Malta, Estonia, Australia, Greece, Portugal, Cyprus, Slovenia, Japan, China, Sweden, South Korea, Indonesia, Taiwan, South africa, Thailand, Belgium, France, Hong Kong, Ireland, Netherlands, Poland, Spain, Italy, Germany, Austria, Bahamas, Israel, Mexico, New Zealand, Philippines, Singapore, Switzerland, Norway, Saudi arabia, Ukraine, United arab emirates, Qatar, Kuwait, Bahrain, Croatia, Malaysia, Brazil, Chile, Colombia, Costa rica, Panama, Trinidad and tobago, Guatemala, Honduras, Jamaica, Antigua and barbuda, Aruba, Belize, Dominica, Grenada, Saint kitts and nevis, Saint lucia, Montserrat, Turks and caicos islands, Barbados, Bangladesh, Bermuda, Brunei darussalam, Bolivia, Ecuador, Egypt, French guiana, Guernsey, Gibraltar, Guadeloupe, Iceland, Jersey, Jordan, Cambodia, Cayman islands, Liechtenstein, Sri lanka, Luxembourg, Monaco, Macao, Martinique, Maldives, Nicaragua, Oman, Peru, Pakistan, Paraguay, Reunion, Viet nam.